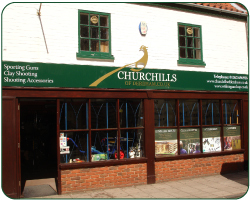 Churchills of Dereham is a country gun shop, based in the heart of Norfolk (UK). 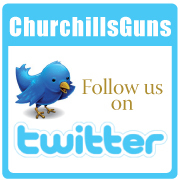 We are main stockists for all the leading brands of Shotguns, Rifles and Airguns. All used guns are warranted and checked over in our on-site fully equipped workshop. We also have many accessories available including binoculars, gun dog training equipment, knives, pigeon shooting equipment, shotgun accessories and lamping equipment, all of which are available online. The gun shop in Norfolk has a large selection of new and used shotguns, air guns and rifles always in stock we’re sure you will be able to find one that’s right for you (NB. we cannot sell shotguns directly from the online gun shop, all shotgun and firearm transactions must be carried out face to face by law. They can be collected at the high street shop in Dereham, or sent via your local firearms dealer). We also have a shooting ground in Taverham, Mid Norfolk Shooting Ground, where you will find some familiar and new faces along with all you would expect from a Churchills of Dereham gun shop incl; lots of guns in stock and a team of knowledgable staff to help you with all your shooting and gun fitting needs. We also have a friendly cafe and of course you can shoot there most days; see http://www.norfolkshooting.co.uk for dates/times. This event is now CANCELLED due to the Game Fair happening the same weekend. Why not come up and see us at the Norfolk Showground? We’ll be on Gunmakers Row… in the usual place. Fancy trying out a Caesar Guerini at a clay shoot? 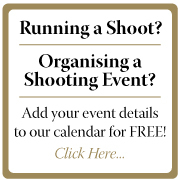 Come along to the end of month shoot and have a go with a CG shotgun!